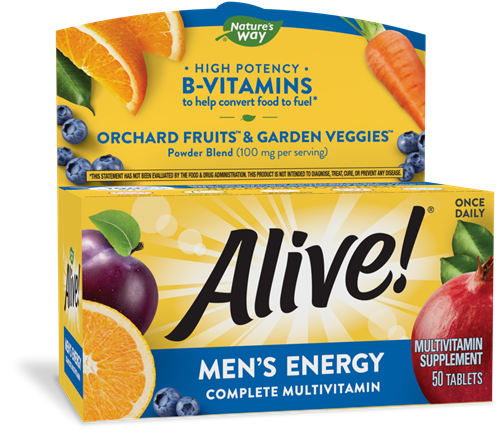 Alive!® Men's Energy - Nature's Way®. Take 1 tablet daily, preferably with food. If taking any medications, consult a healthcare professional before use. Not formulated for use in women or children. Do not exceed recommended use. Calcium Carbonate, Magnesium Oxide, Cellulose, Orchard Fruits™ and Garden Veggies™ Powder Blend (Blueberry, Orange, Carrot, Pomegranate, Plum, Strawberry, Apple, Beet, Cherry, Pear, Tomato, Cauliflower, Raspberry, Acai, Asparagus, Banana, Broccoli, Brussels Sprout, Cabbage, Cranberry, Cucumber, Grape, Pea, Pineapple, Pumpkin, Spinach), Ascorbic Acid (Vitamin C), dl-alpha Tocopheryl Acetate (Vitamin E), Sodium Croscarmellose, Niacinamide (Vitamin B3), Hydroxypropyl Cellulose, Zinc Oxide, Stearic Acid, D-Calcium Pantothenate (Vitamin B5), Magnesium Stearate, Hypromellose, Polydextrose, Sodium Selenate, Vitamin A Acetate, Phytonadione (Vitamin K), Silica, Sodium Molybdate, Riboflavin (Vitamin B2), Biotin (Vitamin B7), Titanium Dioxide Color, Manganese Sulfate, Lycopene, Copper Sulfate, Pyridoxine HCl (Vitamin B6), Beta Carotene (Vitamin A), Folic Acid (Vitamin B9), Thiamin Mononitrate, Sodium Borate, Talc, Cholecalciferol (Vitamin D), Cyanocobalamin (Vitamin B12), Medium Chain Triglycerides, Potassium Iodide, Lutein (Aztec Marigold Extract [flower]).